When a tooth is abscessed, whether due to decay, disease or injury, it is an infected tooth. Most likely, bacteria from an oral or dental health condition has invaded the area below the tooth, and has caused the pulp to become damaged. As pus builds up at the tip of the tooth’s root, a periapical abscess forms. Already a serious infection, an abscess can become more severe, leading to multiple abscesses, including a periodontal abscess of the bone and advanced problems in the gums and jaw. Symptoms of an abscessed tooth include pain, swelling and redness around a tooth, along with a strange taste in the mouth. In some cases, individuals will complain of jaw pain, fever, swollen lymph nodes and even trouble breathing or swallowing (WebMD). On the other hand, some do not experience pain at all, and may simply notice some discomfort when chewing food. In either case, it’s important to contact a dentist right away if you suspect that you have an infected tooth. 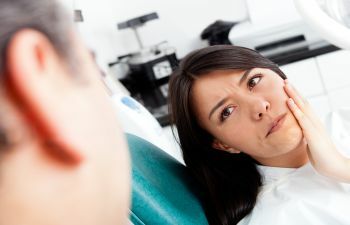 Treating an abscessed tooth depends on the extent of the infection, and if other areas have become diseased as a result. Even so, dentists focus primarily on saving infected teeth whenever possible. Root canal therapy has become a common way to treat abscessed teeth, and this includes cleaning the pulp of a tooth, filling it with a dental filling and/or sealing it with a dental crown. However, if the tooth cannot be saved due to advanced decay, it might need to be extracted. Antibiotics may also be prescribed to treat and eliminate the infection. Do you have pain in your tooth? Have you noticed swelling around your tooth or in your jaw? Have you sustained a recent injury to your mouth or jaw? Is your tooth cracked or broken? Answering yes to any of the above questions could mean that you have an abscessed tooth, or that you are susceptible to a tooth infection. That’s why the team at Kennesaw Mountain Dental Associates welcomes your call today. With compassion, Dr. Contractor and his staff provide trusted dental care when patients need it the most.